"These parfaits not only look amazing, but they are wonderfully cool, sweet and tangy. 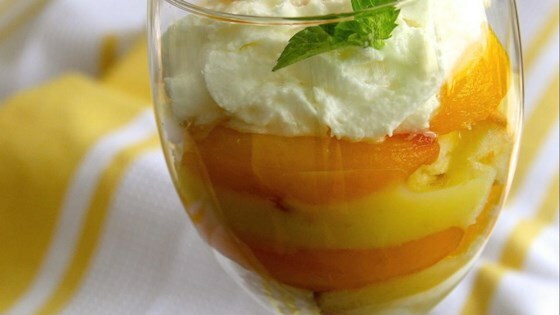 Sliced peaches are layered with pound cake and a light lemon sauce before being chilled and topped with a dollop of sweetened whipped cream. They will make you want to have dessert first!" Place peach slices into a large bowl, and sprinkle with brown sugar. Stir to coat, and set aside. In a medium metal bowl, stir together the white sugar, flour, lemon zest and salt. Whisk in the lemon juice until the mixture is smooth. Gradually whisk in the boiling water. In a smaller bowl, whisk the yolks together. Gradually whisk in about 1/2 cup of the hot lemon mixture. Then whisk the yolk mixture back into the larger bowl. Set the bowl over a pan of simmering water. Cook, stirring frequently until the mixture is thick enough to coat the back of a metal spoon. Remove from the heat and whisk in the butter. Set aside. In each parfait glass, make a layer of pound cake cubes, about 1/2 cup. Top with about 2 tablespoons of lemon sauce, then 1/4 cup of peach slices. Repeat the layers one more time. Top with 1 tablespoon of the lemon sauce. Refrigerate for at least 1 hour to be sure it is thoroughly chilled. Top each parfait with a dollop of whipped cream before serving. What's cooking in Hagerstown? Cindy's ultimate summer dessert, peach cobbler. This was wonderful. But instead of doing individual parfaits...I used a trifle bowl. I also added raspberries for more color. Thank you for the recipe. This was just ok. Will not make it again! Waste of pound cake!